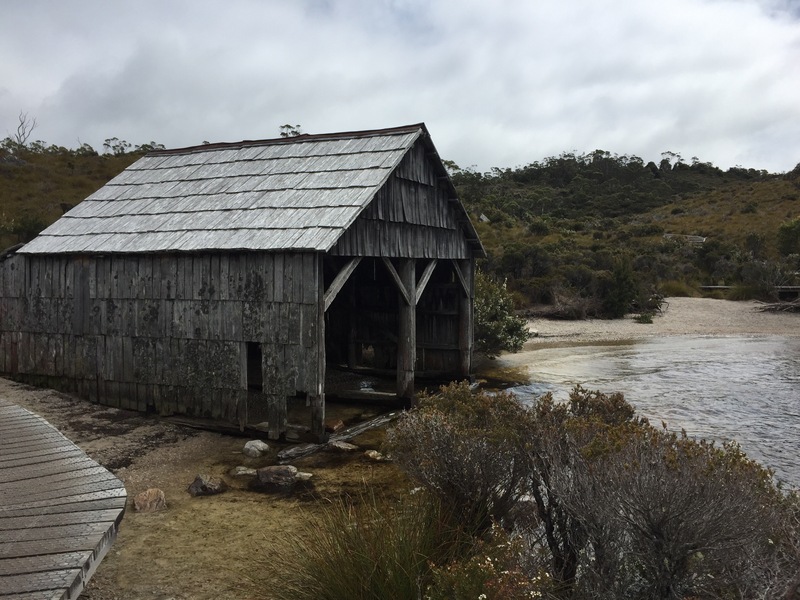 Cradle Mountain was first visited by European explorers in the 1820’s and prospectors and hunters searched the region well into the 20th century. However, it was an Austrian immigrant Gustav Weindorfer and his wife Kate who were instrumental in the process of the recognition of the area that led to it becoming a National Park. Its vegetation is described as a mix of rainforest and alpine. There are conifers (King Billy pine and pencil pine) and southern beeches (myrtle and deciduous beech). I felt very pleased with myself that I spotted the myrtle. 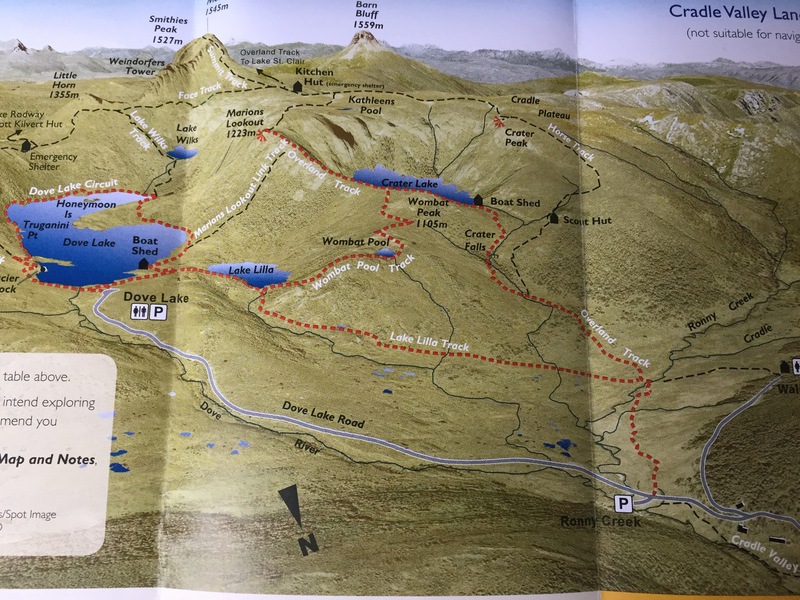 There are a number of walks around the mountain and we checked in at the visitor centre to register our presence and get our passes to take the Cradle Shuttle bus to start our walk. 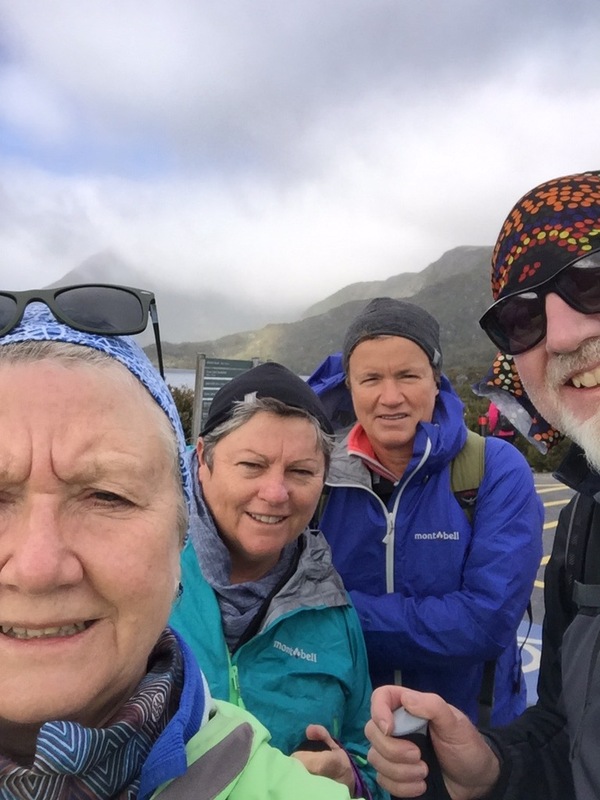 We opted (on Helen’s advice although she was not present) to walk the Dove Lake Circuit. 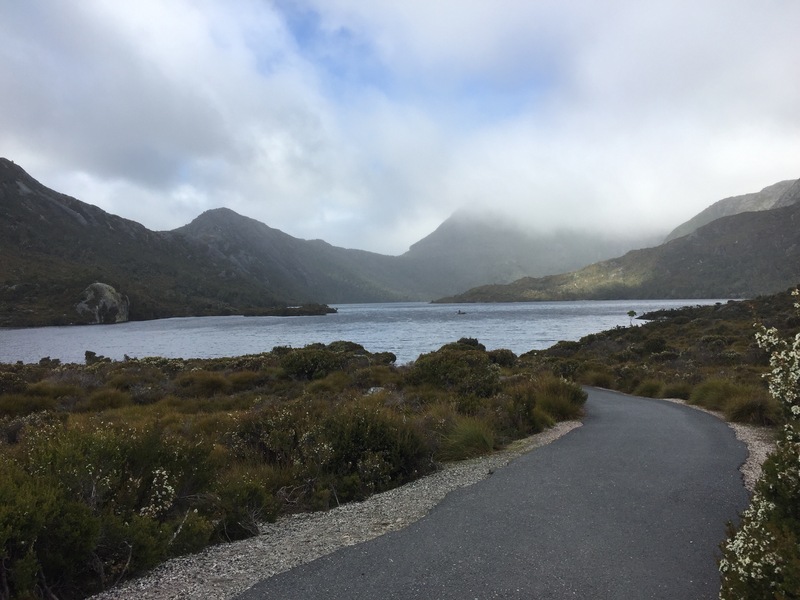 This is a 6 Km walk around the lake with Cradle Mountain looming overhead. We took the second shuttle bus – the queues were amazing – none of us expected the crowds! However, amazingly, within minutes of setting out on the path, we were on our own! We could not work out where everyone disappeared to. 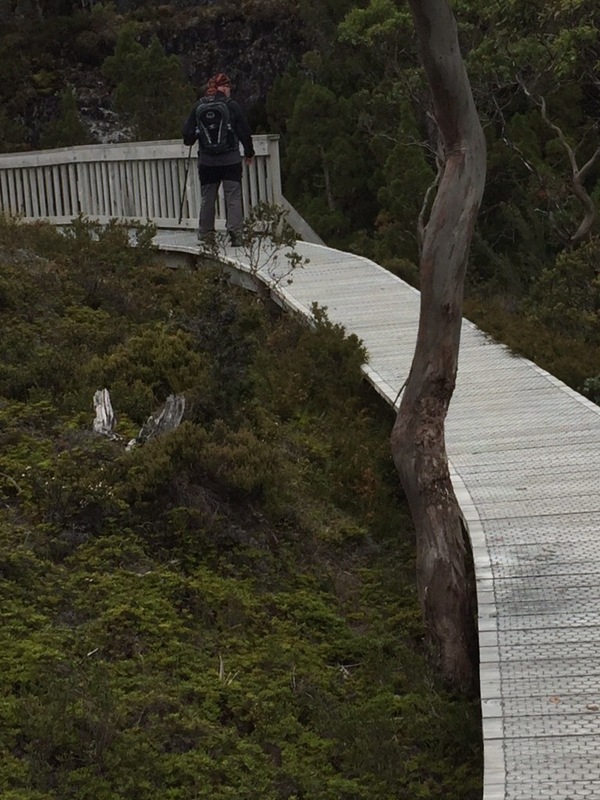 The path was clearly defined, with alternating stony track and boardwalk. It made easy walking through the rainforest terrain, which felt prehistoric. To our right the lake looked freezing cold. It was very grey and overcast. Cloud hovered over the mountains above us. To our left large rocks were interspersed with the snarled trees which covered the steep escarpment. Eucalyptus trees, shedding their bark and cutting grass, with its sharp edge, lined the path. Occasionally we came across a sandy section of shore line. Every now and then a strong gust of wind swirled between the branches of the tall trees, rattling the grasses and strips of sloughed bark. There was a strong sense of walking through an ancient landscape. We entered an area called Ballroom Forest. 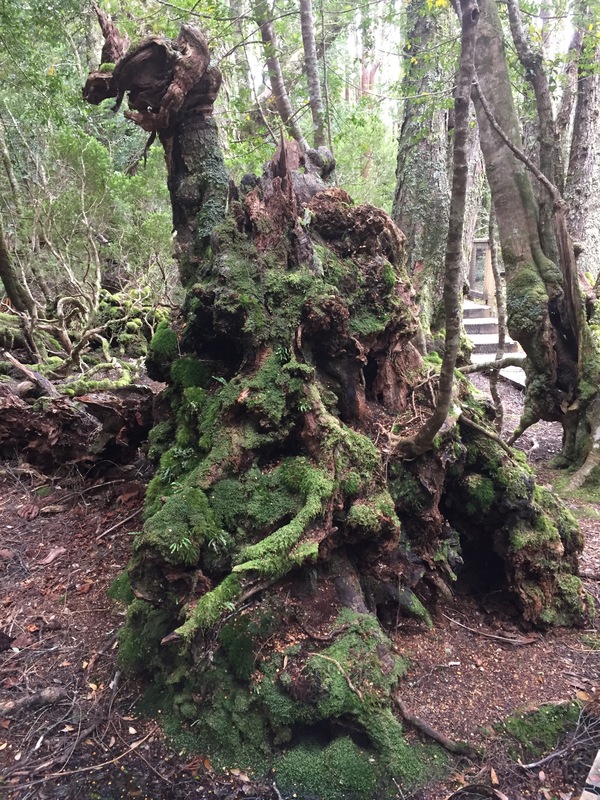 We could not quite work out the title, but the ancient trees here were gnarled and twisted, often covered with moss. A stream appeared running down to the lake and a smart bridge carried us effortlessly over it. Leaving the forest we moved into more open land. Our path took us up and down. 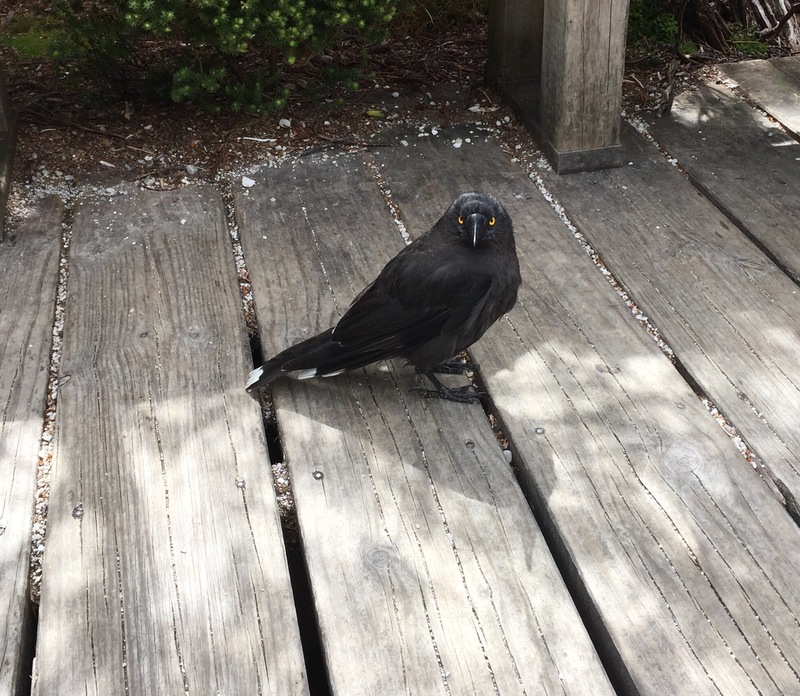 At one stage a currawong appeared, a black raven type bird with bright yellow eyes. We realised that he had his eye on Keith’s apple. It followed us along the path to the lake edge and wasn’t happy until he was given the apple core. Our path took us up and away from the lake. 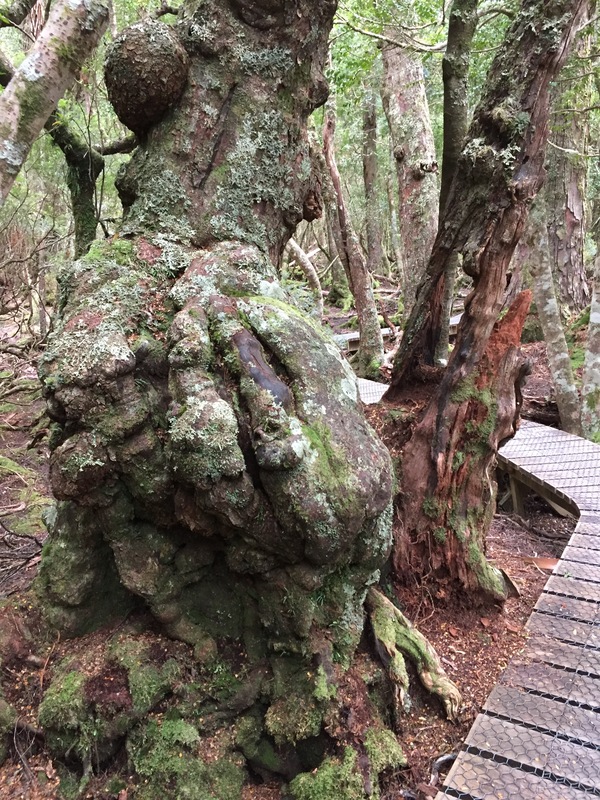 The boulders here are silver grey with green lichen – gone are the red boulders with the orange lichen in the heat of the northeast of Tasmania where we walked only a few days ago……. This is different. It is an alpine region where the weather can change frequently – an hour can apparently see the weather move between sun, high winds, rain and snow. It had a strong feel of the Lake District in England. We were now on the opposite side of the lake to where we started. Gone were the thick forested areas. The terrain had opened out. Behind us the mountains soared, still etched with cloud. Occasionally the clouds parted and the sun came out and shadows danced along with us. Ahead we glimpsed the car park in the distance. 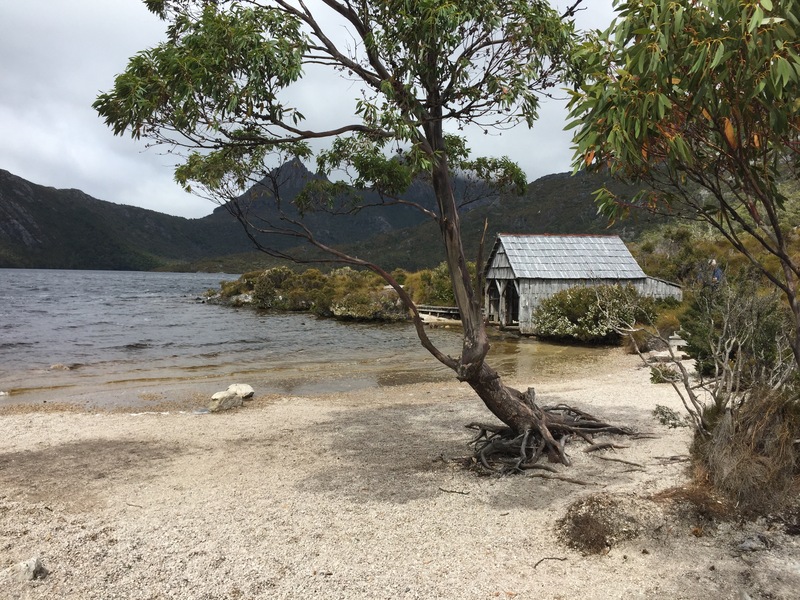 Eventually we came to the boat house we had seen from the other side of the lake. We were nearly back to the car park and we realised what had happened to all the people – they obviously come out to the shorter walks e.g the boathouse, and then go back!! 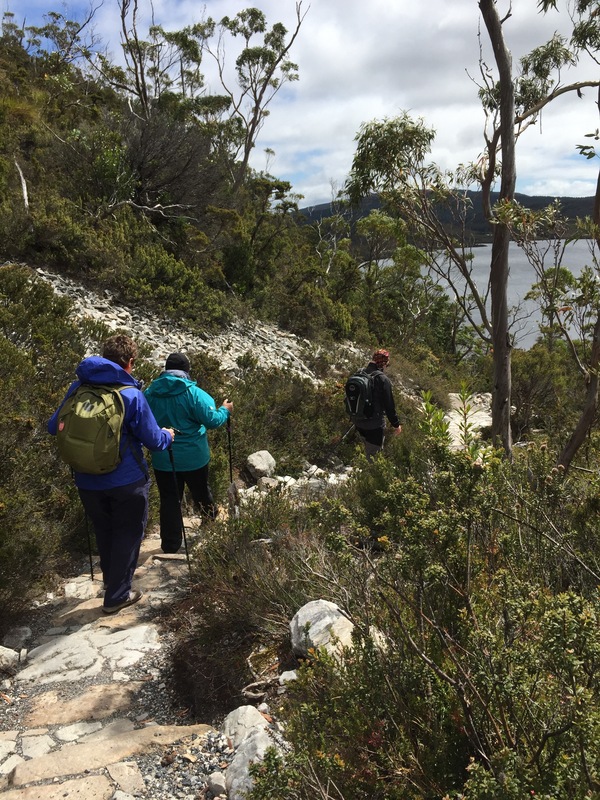 Various paths went off to the left, including the three day Overland Track (not for the faint hearts!!) but we were soon back at the car park. Having consumed our packed lunch, we decided to set out on another track, heading our way back towards the Visitors Centre. To do this we took the route to Ronny Creek via Lake Lilla. 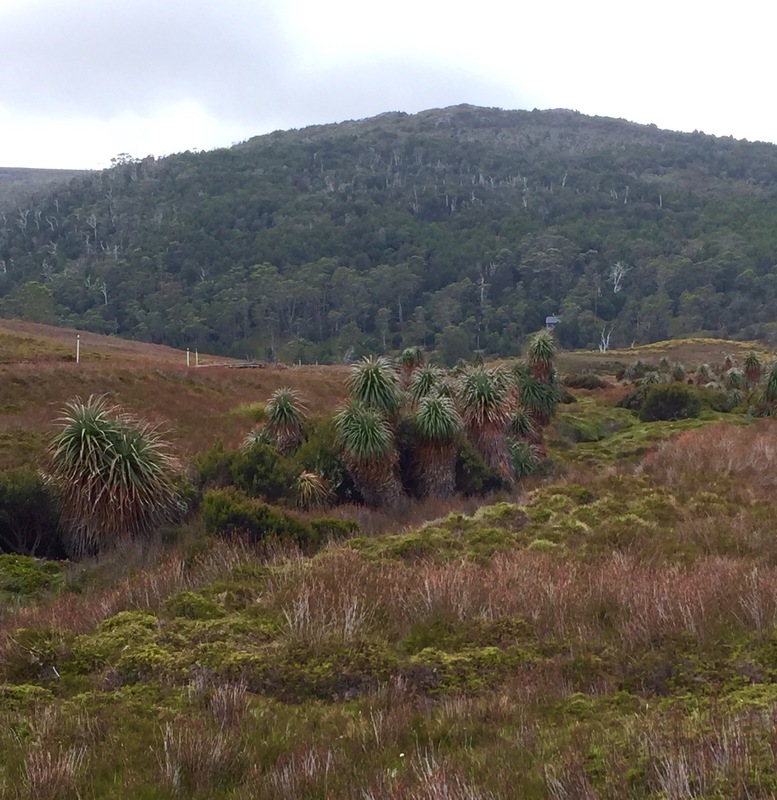 This took us across a long board walk area, this time covered in buttongrass moorland. 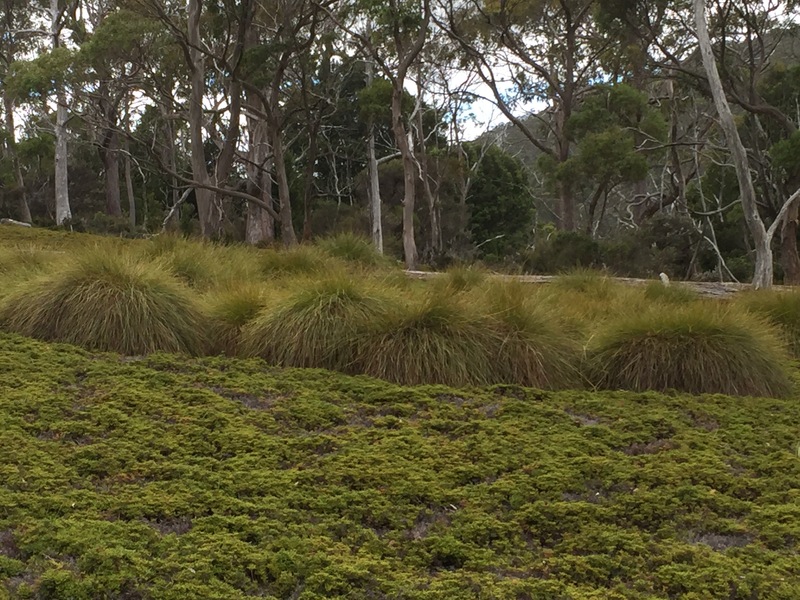 These pom pom shaped grasses cover the meadow type area of the landscape. There were square shaped droppings on the boardwalk which we subsequently learned was evidence of wombats. It appears that they don’t like getting their feet wet and use the boardwalk to keep them out of the boggy ground. Eminently sensible! 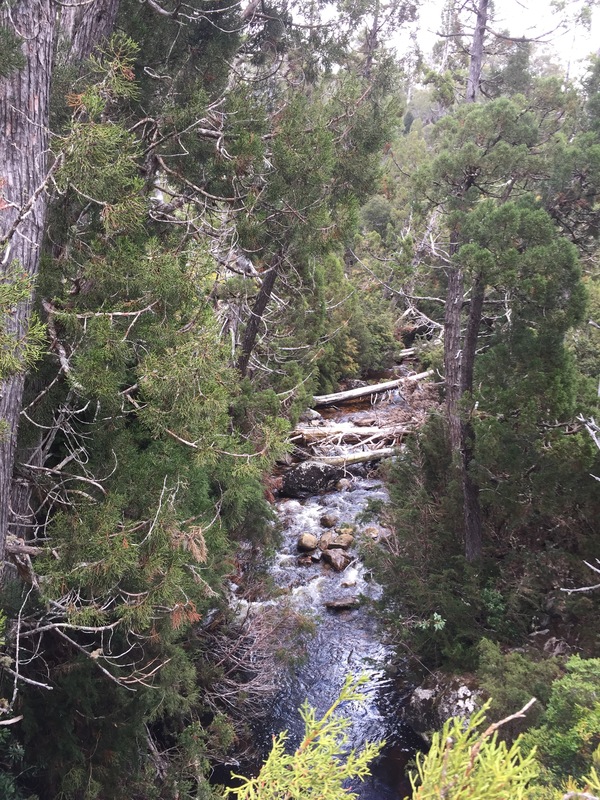 We crossed another water channel where another large, almost succulent broad but spikey leafed plant that obviously liked water followed the waterway into the distance. I thought they looked like a group of hippies bobbling along the riverside. Here there was a cross path, but we continued to head to Ronny Creek. Our route took us across the road of the shuttle bus to the other side of the road. The information board indicated it was another two hours from there back to the visitors centre. We all agreed we were up for this, so off we set. The boardwalk followed the road initially but then departed from it. We were in open buttongrass meadow country again. We followed the boardwalk which enabled us to build up a rhythmic pace of the wire mesh covered wood. It was perfect walking, with occasional steps to accommodate the rise and fall of the territory through which we were travelling. Now and then we crossed a wider waterway by a bridge. Every now and then there were stands of the silver grey ‘dead’ treessometimes twisted into grotesque shapes as if throw their death throes had been tortuous. 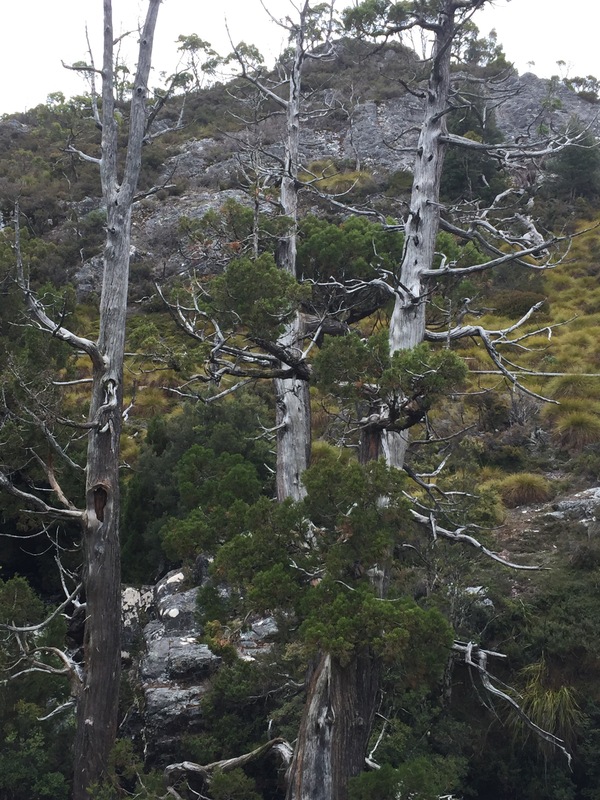 Often the silver trees had fallen to the ground and were being eaten away and reverting back into the soil. The words dust to dust came to mind. The girls left us about half way along the path at a point called Snake Hill. This was a pick up point for the shuttle bus so they were able to hop on a bus quite quickly. We continued the walk for another hour. 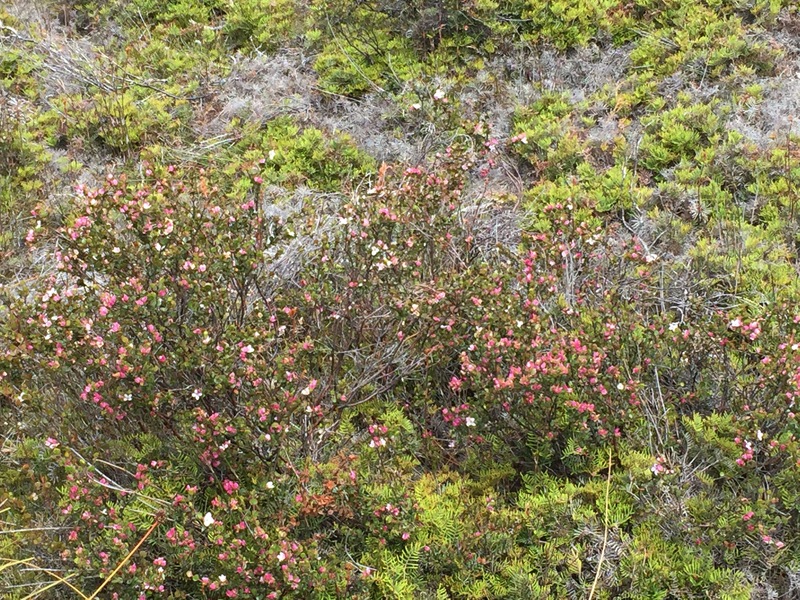 Occasionally alpine type plants covered with flowers appeared. The scenery, apart from our wooden walkway that showed up as white as it snaked ahead of us towards the horizon, was probably very similar to the way it had been for thousands of years. Amazing. We eventually arrived at the Rangers Station which marked the end of the boardwalk. From here we had a 1 1/2 Km road walk to the Visitors Centre to meet up with the girls. 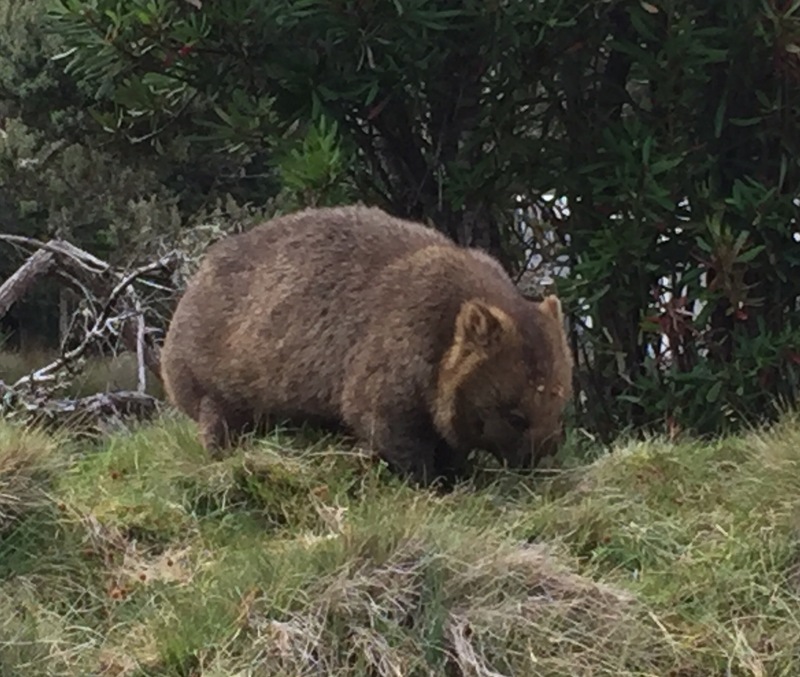 On the way, to our great delight, we came across a wombat grazing on a bank by the side of the road. He was totally engrossed in his munching and not at all bothered by two grimy English people pointing their cameras at him! At the Visitor Centre we found wendy and Sarah again and were soon back in hut 26, our current address. 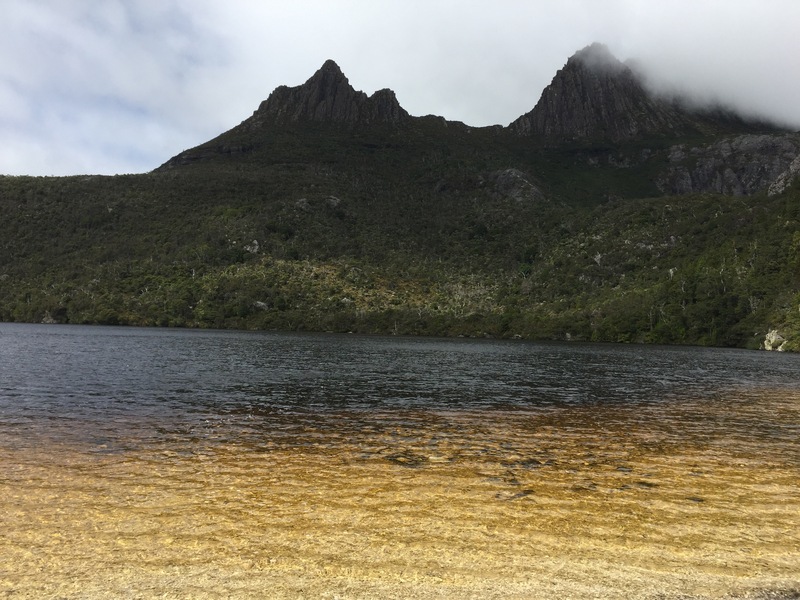 We had thought of doing an evening excursion to see the much heralded Tasmanian Devils but deferred this until Saturday, a good idea as it turned out – we all adjourned to bed before 9.00! This fresh air is heady stuff – a couple of glasses of wine and a great meal could have been another contributing factor! the currawong definitely had its eye on you! Lovely photos & interesting account.